I have been wanting to show everyone a picture of Jacob and our first grandchildren. They are steps but we count them as ours and he certainly counts them as his as he is a stay at home Dad. Naomi got offered a terrific job so they decided it would be good for her take it. He is still trying to get work but alas really needs a drivers license. He is learning. 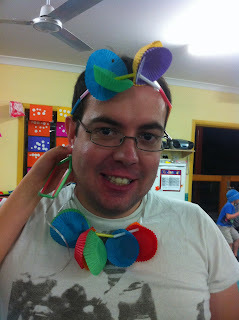 Anyway these was taken last father's day when he was asked to go to Lachlan's daycare to celebrate father's day. Your son is good to be a stay at home dad, I know my husband could never cope. Like Jacob, I don't have a licence either, so I have to walk everywhere I need to go. "Any man can be a father, it takes a Real Man to be a Dad". I would add to that "it takes a Real Man to wear a cupcake garland with style" LOL. Looks like they has a great day. Thank you for your comments. I always knew Jacob would make a good dad. He was the one who took over the mothering when I was away. He has a brother 9 years younger than him who has a few emotional needs and I always knew that Jacob would make sure he was alright if I couldn't be home.